Is a belt sander really necessary for my shop? Home/Latest News From Kalamazoo Industries/Is a belt sander really necessary for my shop? Have you ever asked yourself “Is a belt sander really necessary for my shop?” on several different occasions? Because you are just starting yo purchase equipment for your shop and you maybe on a limited budget. Depending what kind of shop you have, whether it’s a wood working shop, machine shop and or fabrication a belt sander can be really useful piece of equipment and so I would say yes it is necessary. Depending what belt you put on the belt sander you can debur, put grain markings on your metal and or finish work. Next you will want to consider three really important things other than your budget, such as your power supply, space and what material will you be sanding? 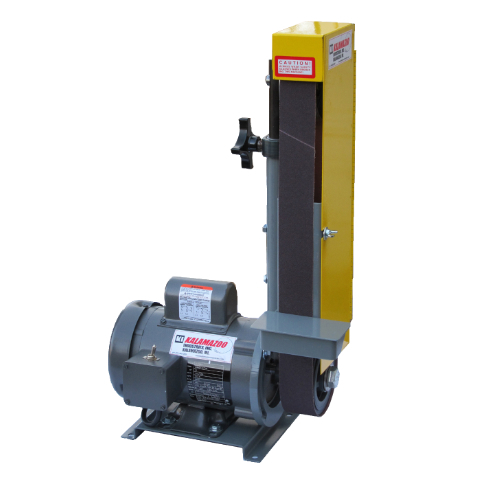 We have three heavy duty belt sanders that you should consider when your shop for you belt sander. 1SM belt sander a great sander for any size shop. Great for touch up work, deburring, putting a grain on your material and or finish work. 1SM specifications:it’s lite weight (35 lbs), removable work table and platen, 1/3 HP 1PH 110V motor and can accommodate any 1 x 42 inch belts. 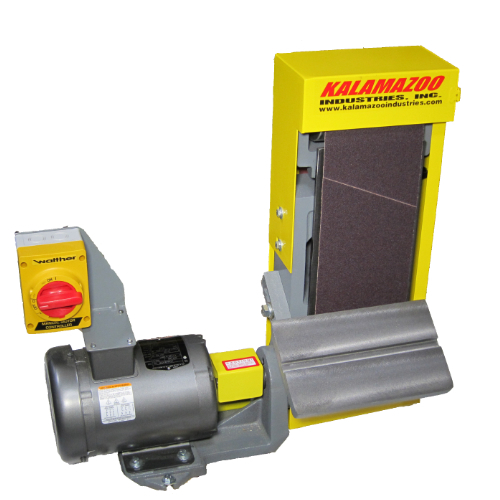 Click here to learn more about the Kalamazoo Industries 1SM 1 x 42 inch belt sander. 2FSM belt sander is another great sander for any size shop. This unit has all the same benefits as the the 1SM but if your wanting to deburr larges pieces this would be the unit for you. 2FSM specifications: It’s also portable just the 1SM. 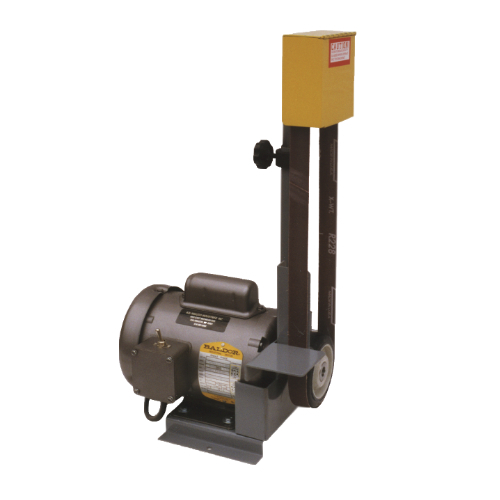 The 2FSM weighs around 60 lbs, multi position, removable work table and platen, 1/2 HP 1PH 110V motor and can accommodate any 2 x 48 inch belt. Click here to learn more about the Kalamazoo Industries 2FSM 2 x 48 inch belt sander. Lastly the S6MS belt sander is another terrific belt sander for any size shop. Again its great for touch up work, deburring larger pieces, putting a grain on your material and finisher for. This unit weighs around 170 lbs not as mobile friendly unless it’s on a cart that’s on casters. Machine specifications: 3HP 1PH and 3PH, 6 x 48 inch belt, heavy duty base and it’s sanding head is multi position. To learn more about the S6M 6 x 48 inch belt sandeer click here to be taken to it’s page. Again these belt sanders that we have discuss above are great for any size shop due to there size and the power requirements. Once you have your machine picked out you then have decide what belt you would like to use for your application and to help you check out our blog “Having the right belt for you belt sander”. We discuss in this blog on how to chose your belt for your applications, so check it out. In conclusion a belt sander is very necessary for your shop because it’s a multi use pieces of equipment that can get a lot done for you. So give us a call at (269) 382-2050 with your sanding application and let us help you find the right sander for you. By Admin|2019-03-21T08:20:44-04:00March 21st, 2019|Latest News From Kalamazoo Industries|Comments Off on Is a belt sander really necessary for my shop?